This larger than average open plan self catering holiday cottage found on the lower slopes of the Great Orme in Llandudno is the perfect location to escape reality and to enjoy some truly stunning panoramic views. Llandudno is an incredibly popular town throughout the year and a popular destination for tourists and holidaymakers. Full of activities and entertainment for all the family, enjoy a fun-filled stay in one of the UK's top tourist locations. The family run business has excelled in the satisfaction of all their guests for over 40 years. A lot of hard work and dedication goes into customer service at the Tram Station Cottage and will certainly not be changing any time soon. You are assured to feel comfortable and relaxed in front of the wood burning stove during a cold night on your winter break, or enjoy a tasty BBQ on the private patio area with truly picturesque views of West Shore and Conwy. The cottage is fully furnished with solid oak furniture and leather sofas, where you can enjoy such luxuries as the plasma TV and multi-media soundbar for a truly cinematic experience. The Tram Station Cottage is a luxurious self catering holiday home found on the lower slopes of The Great Orme. Proud of the consistent 5 star reviews from guests, they strive to give only the best in customer satisfaction. 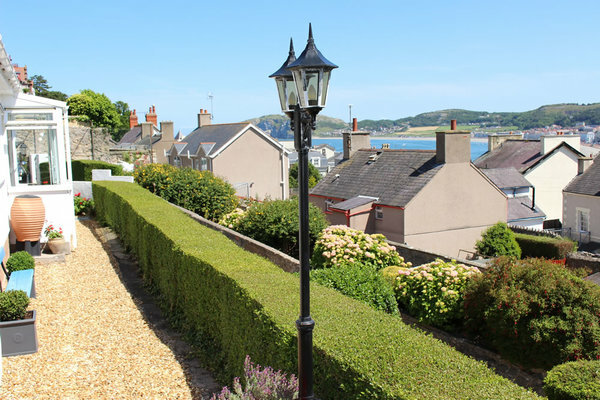 Enjoy the seclusion from the hustle and bustle of towns whilst enjoying the 180 degree panoramic views over Llandudno Bay.